A part from being scared of him, I distinctly remember him also making me laugh. His ring attire was a simple loincloth and he wrestled barefoot. The loincloth itself gave a great effect, but so did his paint job. His face was painted, kind of skull like. He had two big “stars” on his chest – I am unsure what the significance of those are. And finally, an awesome yellow crescent moon on his big belly. This is what made me laugh. Because Kamala “couldn’t speak English”, I could only ever remember him trying to communicate by slapping his belly with both hands. It made a such a great sound and his belly would jiggle like a bowl full of jelly (props to Twas The Night Before Christmas for that expression). Kamala being a big, scary looking wrestler started of as a heel. It was easy, simply by not speaking English he would do illegal things because he didn’t know any better. What impressed me most about Kamala was his finishing move – The Kamala Splash. It was very impressive as he would sometimes do it from the top rope! Kamala left the WWE in the late 80s. Not much is spoken on this, but I assume it would be mutual as Kamala’s run as a heel came to an end and he was not receiving a push from the company. 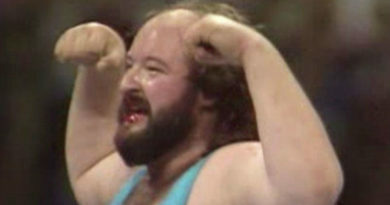 Kamala would return to the WWE in 1992 where his gimmick picked up where it left off. 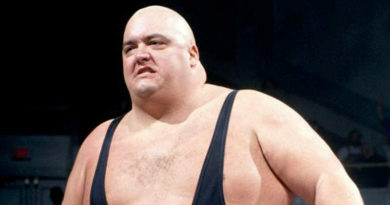 Kamala began feuding with the Undertaker which allowed his character to turn face. During this feud, Kamala began to show personality and was becoming less savage. He was afraid of the coffin the Undertaker was building – rightfully so! After losing the first ever televised casket match (at Survivor Series 1992), he parted ways with his then manager Harvey Wippleman. He had a short run with The Reverend Slick as his manager before parting ways with the WWE again — this was very unmemorable to me. 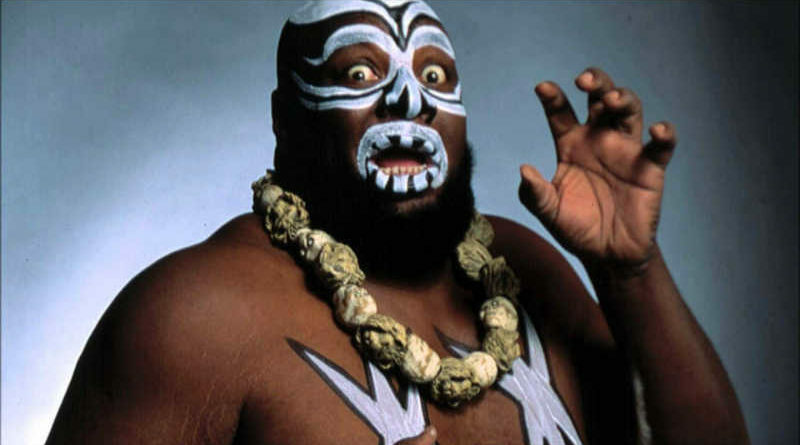 Kamala you will always be remembered as the belly slapping, Ugandan Giant who couldn’t speak English. Later in my life, I’ve read many different things about Jim Harris (who portrayed Kamala) including, of course, that he can speak English very well. Here is a great Youtube video where Kamala reflects on his career as a wrestler. It’s a great video where he candidly discusses his feud with Andre The Giant that lead to him pulling a gun on Andre!